This page is available in 简体中文 and ਪੰਜਾਬੀ ਦੇ. 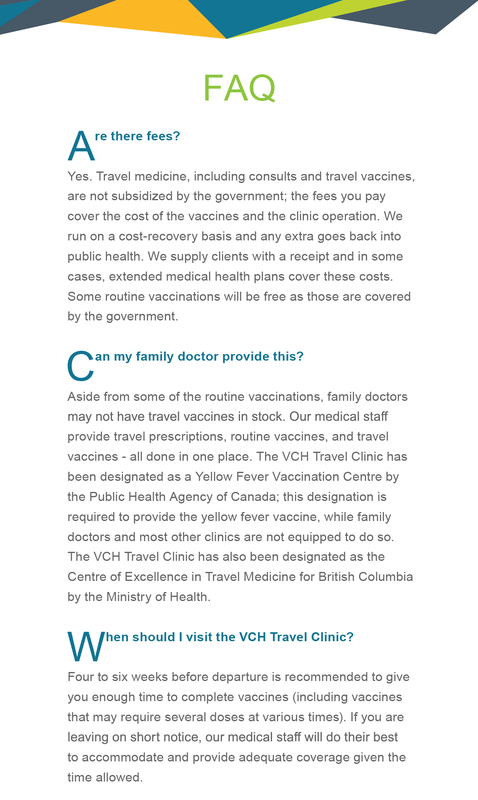 Though the Travel Clinic – Vancouver Coastal Health is owned and operated by the public health branch of VCH, travel medicine is not covered by the government (doctor’s consult and travel vaccines are not paid for). However, the clinic runs on a cost-recovery basis so the funds that do not go towards overhead costs, goes back into Public Health. The doctors at the VCH Travel Clinic provide prescriptions, health advice, and vaccine recommendations tailored to the individual’s medical history and travel itinerary. The nurses will then provide the vaccinations after the assessment with the doctor is complete. The VCH Travel Clinic has been designated as the Centre of Excellence in Travel Medicine for British Columbia by the Ministry of Health. The clinic has also been designated as a Yellow Fever Vaccination Centre by the Public Health Agency of Canada (this designation is a requirement to provide the Yellow Fever vaccine).